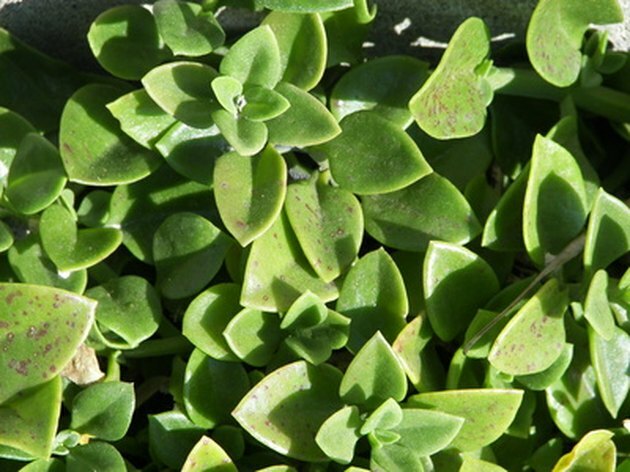 Ice plant is a succulent plant desired for its rapid growth, low maintenance and hardy nature. Grown in mostly sunlight, ice plants give the desert landscape color and texture with minimal water usage. Ice plant requires minimal watering. Most ice plants and other succulents succeed in droughts. Periodic rain or watering is required to maintain the plant life, but the soil should be almost completely dry when the plant is receiving its next watering. Usually, no more than 18 inches of water a year is required to grow ice plant effectively. Ice plant's growth is based on the amount of water it receives. To control, lessen the water amounts and increase the length of time between watering. To speed up the growth, increase water amounts and frequency, making sure to allow the soil to dry somewhat in order to prevent root rot or other fatal diseases from establishing on the plants. Dry-chemical fertilizers may be added to the soil in small quantities before planting the ice plant. The plants thrive when liquid fertilizer is added to the normal watering schedule. The ice plant flowers once a year and should be given vitamin B1 to stimulate abundant blooms.